This updated formula incorporates the newest technology in herbal extraction methods with even more powerful concentrations of various herbs and extracts that have been designed to now be stronger than ever before. It's the Super Male you've been taking, with an extra punch. After reviewing the individual herbal components in the original Super Male Vitality, we decided we could enhance the potency by using higher concentrations of some herbs while lowering the concentrations of other herbs. We also advanced our extraction technology to stabilize more of the active plant compounds and essential oils without oxidation, in order to enhance the natural support and strength of Super Male Vitality by a considerable amount. 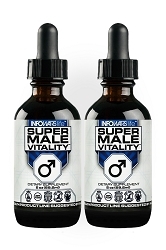 The new Super Male Vitality also contains fulvic acid, which works to carry the individual components of the herbs deep into the body while also providing powerful benefits to the bioavailability of the finished extract. As men age, they may often experience a slow-down in vitality, energy, and overall wellness. 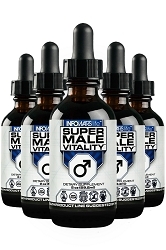 Super Male Vitality™ is specifically designed to assist the body in regulating proper balance to create superior vitality in males, and has been used by Alex Jones in order to maximize vitality when working up to 12 hours a day or more in the fight for freedom. Super Male Vitality™ features a unique formula that is completely free of GMOs (genetically modified ingredients), harmful additives, gluten, and is made right here in the USA. The history of Super Male Vitality™ is based on the proprietary Spagyrex™ process, which was invented during extensive research on the numerous biological deficiencies that males may experience after they age. Tribulus terrestris is a vigorous plant integrated into the Super Male Vitality™. 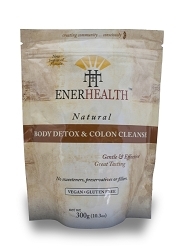 Numerous benefits regarding vitality are attributed to the plant by men worldwide. Suma is a ground vine with deep roots. It is native to the Amazon and other parts of South America. Suma has been in use for nearly 300 years. It's even been called "the Russian Secret" due to its use by Russian athletes. Also known as the common oat, avena sativa contains natural compounds that may help support normal response in men. Tongkat ali, or Malaysian ginseng, is traditionally held to support a number of natural functions in men. Native to the Amazon, catuaba is a small, flowering tree. Its bark was discovered by the Tupi tribe and described as having qualities that may aid in male vitality. Muira puama is a small tree native to the Amazon. Practitioners of Brazilian herbal medicine reportedly use muira puama bark.